The Venn diagram circles of professional basketball writers and food writers overlap very little, but within that narrow sliver lies one journalist who’s covering the NBA-food beat better than anyone else: ESPN’s Baxter Holmes. If the name isn’t familiar, you may recognize his 2017 story on the league’s obsession with peanut butter-and-jelly sandwiches. That piece, for a week last March, must have popped up every other post on our social media feeds. This week, Holmes—an alumnus of The Boston Globe and the Los Angeles Times—returns with a story just as fascinating. 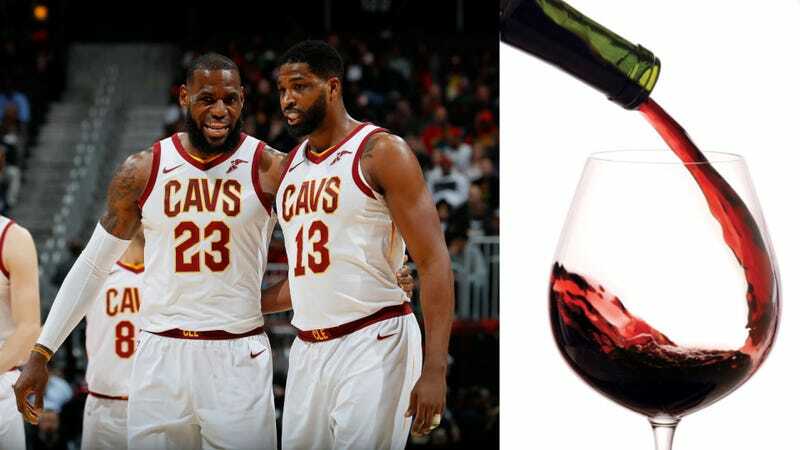 In The NBA’s Secret Wine Society (appearing in the February 19 issue of ESPN The Magazine), Holmes explores how wine has replaced expensive cars, sneakers, and jewelry as the league’s symbol of high status. Holmes tells us of players, such as Minnesota Timberwolves guard Jimmy Butler, who travels with a wine case; of Miami Heat guard Dwyane Wade, who partnered with a Napa winery and founded Wade Cellars; of the Cleveland Cavaliers taking a team wine-tasting retreat to Mayacamas Vineyards, one of Napa Valley’s most renowned wineries. It’s the most compelling and interesting story we’ve read this young year, and we encourage you to spend 15 minutes with it. Then come back here and check out our talk with Holmes. The Takeout: When did you first get the inkling that a number of NBA players were actual oenophiles? Baxter Holmes: I kept noticing players were posting on social media of their time visiting Napa, or to different wine-rich regions—France, Spain, Italy—and talking about wine. There was Dwyane Wade, who invested in his label Wade Cellars in Napa, and it just seemed like it was more than a side project. From there, what I was curious about was trying to find people in the wine community who could give me context about their interactions with NBA players. There was a master sommelier who told me how blown away he was in [the NBA players’] thirst to learn, the detailed questions they were asking. Someone said at one point that these players were drinking the wine, not the label. So they were less interested in trophy wines and more interested in wanting to understand how these wines came to be. I spoke with well over 50 people for the story, and then it was trying to boil down the best scenes and most-compelling material to carry the story. TO: The most interesting aspect of the story was how these rich athletes, who have this reputation for spending their vast wealth on expensive cars and jewelry, now saw wine as a status symbol. Why do you think this fermented grape juice became so alluring to so many in the league? BH: It’s hard to pin down an exact thing. One of the corollaries as to why they’re into it, is once you hit 30, some of the players talk about wanting to slow down, wanting to relax a bit more, not go as much, take better care of their bodies a bit better. Another thing I heard from those in the wine community was how when the NBA instituted its dress code more than a decade ago, players got really into fashion. And when they attend fashion shows, what’s on the table? It’s wine and champagne. Same thing with players who are interest in technologies and investing with venture capital firms in the Silicon Valley—what’s on the table? It’s wine. But the thing you have to remember is these guys are very, very, very competitive people. If one player gets into it, it’s not just enough to be casual about it. They want to know more than the next person. They want to ask better questions when visiting a vineyard. They want to procure a harder-to-get bottle. Once the competitive nature takes hold, it snowballs from there. TO: Of all the players you profiled, who would you anoint as the master sommelier on the active NBA roster? BH: I say this with full respect of the incredible, almost-impossible difficulty to be a master somm. But the guy who’s probably furthest along is Carmelo Anthony [small forward for the Oklahoma City Thunder]. A lot of players told me he started earlier, about 2007. And then when he was traded to the New York Knicks, he became close to some people in the wine community there. There’s this anecdote in the story about him attending a gathering at the home of one of the biggest wine collectors on the East Coast, and the mandate was to bring your most excellent bottle to this gentleman’s house. [Anthony] was telling me how much he was sweating over that decision because he knew everyone was going to bring something incredible. He’s also obsessed about watching a lot of wine documentaries, and pick up on tasting notes during blind tastings. So he’s probably a guy I’d put as a front runner. LeBron James [of the Cleveland. Cavaliers] isn’t far behind. LeBron’s a bit more guarded about revealing publicly, although on Instagram he posts a ton of information about which bottles he’s enjoying. You can go on his Instagram account and pretty much get a sense of his palate and what he enjoys.